Learn About the Services of Holy Week: Have you been Catholic your entire life and have never attended the services of Holy Week other than Palm Sunday and Easter? Or have you attended the Holy Thursday, Good Friday and Holy Saturday Vigil and not understood the symbols and rituals? Or perhaps you have thought “Jesus is risen why are we remembering his passion and death?” Join us Monday, April 15 at 7 pm in the Community Room as we reflect on the one continuous celebration that begins Thursday evening and concludes Easter Sunday. Let Fr. 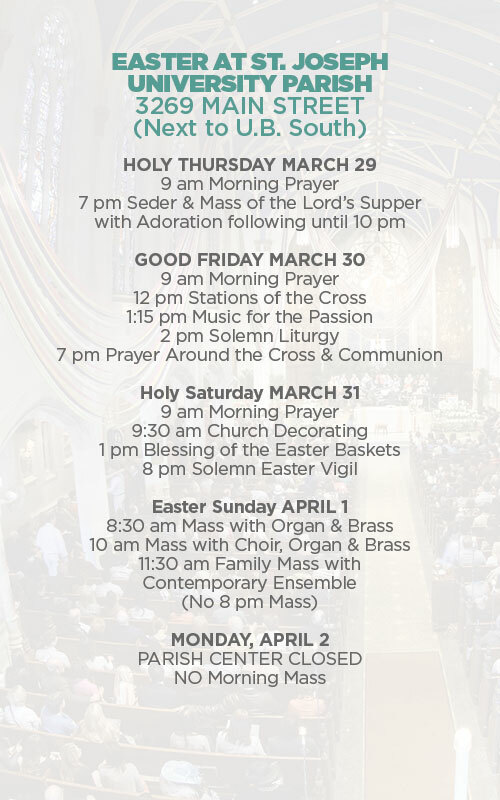 Jack & Sr. Jeremy delve into the meaning of these rituals with you as together we reflect on the Liturgy of Holy Week.